Today almost everyone know that sport can really make human life more active and better and sometimes it can really save people. For that reason the physical activity popularization is necessary to attract more people to sport organizations. And the main method of such attraction is website. Typical sport organization website consists of three basic components – motivation content, achievements and contact information. Contact information can help people to find an organization branch near their home and to find a local representative to get additional information. And the best way to represent organization contacts (especially if organization has a big branch network in USA) is jquery USA map. 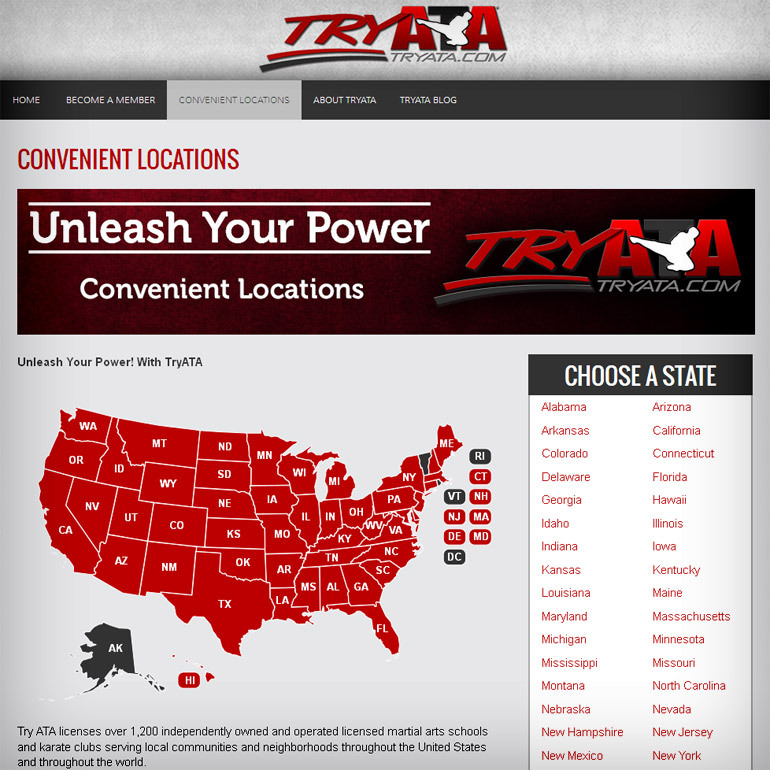 One of our clients is TRYATA – famous karate sport club which have many branches in USA and we helped them to embed a colorful interactive map which you can see here. This map is developed as a special WordPress plugin and can be installed with a few clicks. As you can see the developers customized the whole map in accordance with the website design and refused to make popup windows with additional information. Instead of this they decided to put additional contact information into separate web pages with more detailed Google map. This combination of Google technologies and our interactive maps can lead to the effective visitor’s interaction with the website.